I know Durban lays claim to the Bunny Chow but in the 50s / 60s, my diet, and I would be safe to say that of countless others, was often supplemented by Pie, Chips and Gravy. This would have been true whether you were “having a graze” at the Cuban Hat, The Nest, XL Tearoom, Noddys on the beach front, the OK Bazaars Milk Bar, Greenacres Lounge, The Three Monkeys, the Roxy / Oxford Bio Cafes, the Varsity refectory or one of the small eateries / tea rooms in and around the CBD. Pie, Chips and Gravy was a cheap menu standard. At the beachfront it was round about 15 to 20 cents a serving. Most of these places relied on one firm to supply and that was Perks Pies, which was a name synonymous with a steak and kidney pie in Durban. That was their forte and I cannot recall at the time having any other choice such as chicken, vegetarian, or other filling. Pies were pies, round and with a flaky pastry top and kept hot in a see through glass counter warmer. No microwaves in those days. The gravies were normally thick and dark brown, these of course left to the eating establishment to make up. With pocket money being tight, PC&G was the way to go, albeit one’s hunger in those days was to some extent insatiable and one could easily have devoured a second serving. A Coke was normally the wash down beverage. Eating on the hoof, a Perk’s Pie was sold in an open grease proof paper packet printed with the name PERKS on it. I recently bought a book dated 1964 wherein some of Durban’s well known firms at the time are included giving some of their history. Perk’s Pies is included and the page is attached. The original building in my time had already been replaced with the multi storied building shown below. This was situated at the bottom end of Berea Road, close to the Lancers Road corner and opposite where Umbilo Road joined Berea Road. The building’s upper floors were flats with the retail outlet at ground level. The bakery was at the back of the building. Looking at the cars in the picture I would say the photo was taken soon after that building was completed probably late 30s, early 40s. Note there are no overhead trolley bus wires in the picture. Berea Road had an up / down trolley bus service by the 1950s, the route being called Toll Gate. From Town, trolley buses went up Berea Road as far as the Old Toll Gate Bridge, used the bridge to cross Berea Road and then went back into town. This all changed when Kinmont’s Canyon was started in the early 60s (?) and Berea Road, which was a wide 4 lane road divided by a treed centre island was changed for ever. The old Toll Gate bridge was demolished and replaced with the present arched bridge we have now. Perks Pies as far as I know no longer exists and perhaps someone could fill in the later history of the old Durban firm. I know that my mum and her boarding school friends in Pietermaritzburg were avid Perks supporters as far back as WWII. My dad often talked longingly of the pie cart which was, I think, located near Durban station and was one of the only places in Durban where one could get something to eat at all hours in the early days. I have an idea there may have been a pie cart in Pietermaritzburg as well. Micks Pie Cart at Durban Station was a landmark in its own right! Tethered to an electric light pole, on the roadway next to the pavement during the day it looked like an oversized shoe box! The tether to the light pole was not for security purposes but rather to facilitate an electrical connection that supplied power to run the large old fridge inside the cart and provide power for the electric lights that illuminated the interior and the outside counters! Off course, Mick paid his electricity bill every month!! At night Micks Pie Cart took on a new look! To see this chrysalis to butterfly transformation you needed be of a stronger constitution than the normal folk who sidled off to bed around 10 pm! To be sure I am not even certain as to opening time in the evening – I would guess around 11.00 pm! Anyhow, it was about the time when those of us who had imbibed freely, smoked a dozen Texan and caroused with a girlfriend in a dim lit club wanted something to “fire up the engine once more”! It was more than likely that the girlfriend had been returned home at this time and dear old Dad was able to nod off knowing that his little snookums was safe in her bed! Suddenly, with a bang and a clatter the counter sides would be let down! The sides were part of the walls of this caravan type structure and folded down to “elbow height” so that one could take the weight off the feet and stand with elbows on the counter and face cupped in the hands! From this vantage point on could see the length and breadth of the interior, the very old and large fridge dominated the left hand end of the caravan and the equally old and large coal stove the right hand end! Probably a Welcome Dover! For the life of me I cannot remember the number of folk that worked inside this contraption but I think there were three. I seem to remember the guys were wearing vests as they worked to try to keep cool! My favourite nosh for the rebuilding process was Sausage, Egg, Mash and Gravy! A slice of white bread and a sweet cup of the famous MPC tea completed the meal! There were quite a few “favourite” dishes, all accompanied by the proverbial gravy!!! Dishes such as Pie and Gravy – Chips, Pie and Gravy were just some variations, just as long as you had gravy! I could ramble on for another page on MPC but I am sure there are other stalwarts of the night who would like to have their input on the much loved old MPC!! They were great days! I also recall a cafe near motor town where you could get a genuine mixed grill quite late at night! Was it Snappy Snacks?? A little extra on Micks Pie Cart In Durban! I never ever met Mick. I often looked at the guys in the pie cart, or caravan if you like, and wondered which one was Mick! Was there a Mick and where did he hail from – never got around to finding out! Maybe someone out there knew him! Bet there are some stories he could tell! The cart was always busy during the time it was open and there was no time for chit chat as orders were received and issued to customers. The opening times seemed to coincide with the end of the late night shift of the shunters and allied SAR personnel who rushed to MPC to get a very late supper or a very early breakfast! These chaps used to wear a very distinctive uniform which, I think, consisted of black boots or shoes, black longs, and a black waistcoat topped with the traditional black cap! The shirt was Khaki in colour as far as I recall! Having worked a long shift getting all the rolling stock into the right place and order they were naturally hungry and thirsty and some were understandably grumpy! “Other customers” were also a tad grumpy but for other reasons! Inevitably a fracas developed between the two sides and after a couple of punches were thrown and honour was satisfied the serious business of getting some food resumed! A strange memory I have is of the floor in MPC being covered with lino, or linoleum to give it the right name! I seem to recall some very bright pattern, although this may have had something to do with the Cappies and Coke? Allan man what interesting reading it took me back a lot of years. I was born at Addington Hospital in 1949 and when growing up I can’t tell you the number of times we used to come from the club’s early mornings and stop at Micks pie cart. I could like many people I am sure go on and on about nights/early mornings spent there . I thank you for the read as I have wondered about that Durban landmark for years. My added memory is that at the end of the main station building on the Pine Street side there was a grey painted corrugated iron building which was the “porters’ office”. irIn front of this office, a loading zone parking was available where cars or taxis could pull up. The porter would then come out with a heavy rubber wheeled steel trolley and load up your luggage. They would ask which train you were catching and would make their own way to the platform and wait for your arrival. If you wanted to you could leave your luggage in the “Left Luggage Depot”, a place where you could leave your cases in safety if you wanted to. There was a small charge for this service. Porters, also had a “uniform” of black trousers, a white shirt with a black tie and a black waistcoat, topped off with a black cap having a SAR/SAS badge. On their chest was a SAR-SAS oval badge with the word PORTER / KRUIER on it. It was normal to tip the porter. If you were taking the night train to Johannesburg for instance, a passenger list was put up on a glass enclosed notice board on the appropriate platform. Here you looked for your name and from that you could ascertain the coach number as well as the specific compartment,A B C D E F … that had been booked to you. There were 6 people to a standard compartment. One then went and found the specific coach which had a specific number sign written above the entrance doors which were at each end of the railway coach. On the coach itself each compartment window on the outside had a small spring device where a small paper tag was inserted. On this all the passengers names were typed and specific sleeping locations were allocated. These locations gave you which bed you were allocated for the night either Upper, Middle, Lower, Facing Engine or Upper, Middle, Lower, Back to Engine. This was done because some people did not like sleeping on the upper bunk which was quite hard to access for a not so nimble older person. Everything I must say was well organised. Having done the Johannesburg Durban trip quite often the rigmarole became routine. Allan, regarding Micks Pie Cart. My memory of it was that it was not left in situ there during the day. My memory is that in front of the steps leading into the station building, there were two maybe three parkings reserved for the railways MTB buses. These travelled daily to Pietermaritzburg and the South Coast. These buses did not run at night and Mick’s Pie Cart would take over this parking as you say late at night. By morning MPC would not be there. I agree as you say it was run by anonymous people. I seem to recall that the side shuttering which enclosed the sides when opened out formed shelves which served as your eating table. I must say thinking back it was laid back and not the most hygenic. You have really prodded my memory!! It was not too often that I went into the coffee shop! I always seemed to be in a rush but I do remember catching a whiff of coffee aroma as I scooted past! I seem to remember a little of the inside of the coffee shop! Stainless steel urns, stainless steel coffee and tea pots and white cups and saucers! The coffee/teapots were of the variety that offered a challenge to the user to be able to decant the contents into the cup without dribbling a fair amount onto the white table cloth. If my memory serves me well then I seem to remember that the furniture was wood in a darkish color with an tile inlay to serve as a counter top and the floor was of a patterned tile variety! Maybe Gerald or Allan will remember more clearly!! Staff were always neatly turned out and efficient in the way that they went about their business! My memories of the area where the coffee shop was situated are of a warm, friendly section of the station whilst the business end of the building, the departute/arrival platforms always smelt dank and “cindery”! I think that it was mostly Garretts that were the behemoths of the day! These seemingly enormous locomotives dragged passenger and goods trucks all over SA! The North and South Coasts seemed to monoplise the arrivals and departures from these “front”platforms and I think they were numbered 1,2, and 5. Seemed to have an odd 5 if I remember corectly! Then the was the famous wheel tapper who had this great big hammer and went along the track, banging each wheel to see if there were any cracks in the steel! The tannoy system the blurted out the details of the arrivals and departures – a really sick and mournful sound!! Thje cold breeze that sometimes whistled in under the open eaves that covered the platform and tracks and lifted the girls skirts as they alighted from the train! I loved it all and wonder whether my children could have, or would have loved the SAR, Durban Station as well! I can hear the whistle blowing, got to run…..
And let’s not forget gravy of the curried variety. I remember it fondly. I wonder when it was introduced? Ja, Alan. It was Snappy Snacks. They also sold a great pickled fish and onions take away. It was kept in the coke fridge under a cotton net to keep chilled. Healthy stuff!!!!!! Further useless information is that the diameter of each piston was +- 13 inches in diameter. As a 10 year youngster in Primary School, I spent many holidays with family in Harding and my father would drop me at the “Luxury Bus” stop on the step outside Durban Station. There I would stand, clutching a brown paper in one hand and a small suitcase in the other!! There were two drivers on the Kokstad route and I knew them as a Mr Joyner and a Mr Webb. One would do the up trip whilst the other was busy doing the down trip from Kokstad to Durban. Once my father had handed me over to one of the drivers he would watch me get onto bus and take the seat for small boys or infirm passengers, right next to the driver, eyes agog and heart beating as the driver fired up the mammoth bus – and then with a swish of the door closing pneumatically we were away!! Yes I knew it as the Pullman. Have a look at the November 2011 Archives under Postcards and there is a picture I have posted. You’re right, Gerald. The most common name for this behemoth of a vehicle was Pullman. Where and why this name I really do not know. Maybe someone can enlighten me!! In any event, I seem to remember that there was always a small group of interested spectators at the station to witness the arrival and departure of this remarkable vehicle!! I was in awe of the vehicle and the drivers, my anticipation of the ride was tinged with apprehension that we would go over the edge somewhere along the route. The route being up through the Berea, into Mayille and up to 45th Cutting, Cowies Hill, thru Pinetown, up through the KLoof area, Pinetown, Hillcrest and then the climb up to Bothas Fioll – much the same route as the Comrades Marathon!! Hi Gerald with regards to the Spoorweg trains have a look at this link http://www.youtube.com/watch?v=N29oGGOFxzc&feature=related it has Bill Flynn in the video, about 12 minutes long. My great-aunt, Alice Charlesworth, was married to Joseph J Perks. She was born in Birmingham in 1859 and emigrated to Pietermaritzburg in 1880, with her parents (my Great Grandparents) and siblings. 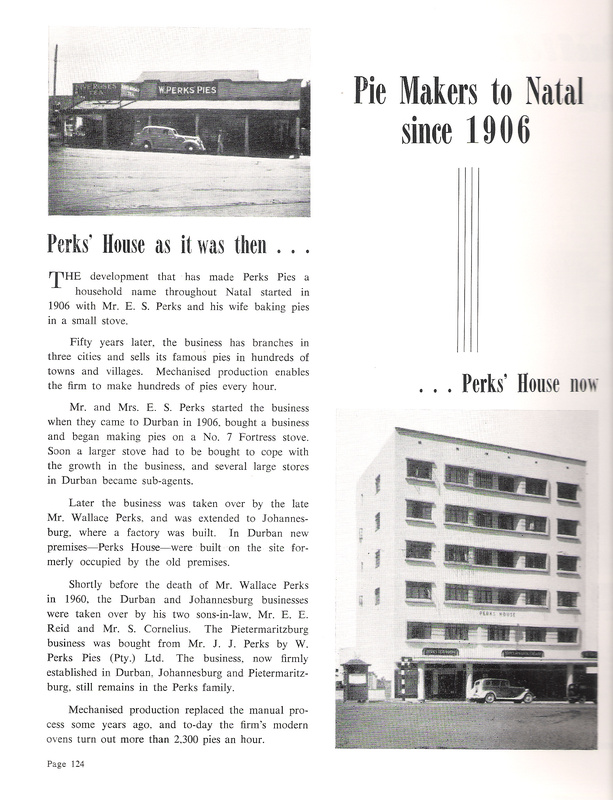 Family legend tells that the Perk’s family began making and supplying pies to the British Army stationed in PMB. I do not know if you were able to read the script from the book that I attached to my article on Perks Pies. If you click on the picture the writing is enlarged. There is a reference that the business started in 1906. Charlesworth? Any relation to Allan Charlesworth from Pietermaritzburg. Tall lanky guy who started work at Dept of Posts and Telegraphs (later Telkom) in 1962. He was a Natal table tennis player if I remember. Hi Chris, Are the above brothers who served with the Natal Mounted Police circa 1879 related to you? Thomas drowned in 1884 while swimming a river in the Northern Territory whilst serving with the South Australian Mounted Police and the SA Police historical society would like to add a photo to his memorial records. CHARLESWORTH Th0mas. Enlisted 17.8.76. Trooper, Natal Mounted Police (No125). Zulu War 1879; service in Natal. CHARLESWORTH Walter. Enlisted 17.8.76. Trooper, Natal Mounted Police (No128). Zulu War 1879; service in Natal. Thomas drowned while on duty with Sth Aust Police near Darwin 1884. We are endeavouring to acquire photos of both brothers who lived in Pietermaritzburg for a memorial site. Lot’s to tell you, as your message has filled in blanks for me. Yes Gerald……I am in email contact with Allen. We share the same Birm-eese Great Grandparents He & Christine spend a lot of time travelling around the world now. We last spoke in 2011 and they had been in China for some months. Allen’s Aunt, Ethel Charlesworth, married Ian Vermaak. Ian was a Springbok Tennis player. He owned Vermaak’s Sports Shop in Pine Street. I have done extensive research on the family tree (2001 – 2011), which proved to be a success with those family members I cound find. I even managed to hook up with an Englishman in Chesterfield with whom I share Great-great-great grandparents !!! The Internet is the most amazing tool. I may even have a few of your scans on that site..LOL. I trawl the web very frequently for postcards and have at least 200 more to upload. Time is of the essence. Keep up the brilliant blogs. They fill a longing in me for 1960’s & 70’s Durban…. In the early 60’s, I used to have a Perks S&K pie every saturday morning on the way to Kingsmead with my dad who was a footie referee. Great pie! Perks Pies were a Pietermartizburg company – my Mom was born into the family and still has the original pie moulds. Please let me know who your mom is. My Mom and aunt (Denise and Frances (née Perks)and spouses owned Perks Pies (Durban, Pmb,and Jhb) until it was sold in 1974. Would be interesting to find other family. I have been researching my family tree and found info on Perks Pies. Cyril George Clarke Perks who married Helene Margueritha van der Bijl. Spalding – who started Mrs Ball Chutney. reading but does not provide much info. The press cutting at the start of the blog refers to a Mr Wallace Perks. There was a pie shop opposite the post office in Pietermaritzburg called “Wallaces Pies”. They made the finest pies I have ever tasted – this in the sixties. I am sure there must be some connection. A couple of my friends were talking about the good old days, and everybody remembers the pie and gravy that was sold on the railway stations. Is there anybody out there that knows the recipe for the gravy? Fry 1 onion with a scoop of mince and one cup of the above and relive the taste of the gravy over your perks pie. Has anybody got the recipe of the Perks Pie. Perks Pies were also sold in Johannesburg in the 1960’s and 1970’s. At this time I believe the company was owned by one of the milling groups, possibly Premier who clearly didn’t do a good job running it as it went out of business or was merged with another division. They used to sell Perks steak and kidney pies at the school tuck shop (Virginia Primary) in late sixties, early seventies. My mom would give me 10c every Friday, for which I could purchase a pie for 9c and a few gummy clown faces or fruit squash for 1c. Still remember how they tasted and no pie I have eaten since has even come close! My husband Jon was at school with one of the Perks dynasty (not sure which one) at Highbury school in Hillcrest in the fifties. I remember that at first tea time we used to run to the tearoom just to get a Perks S/K pie or Sausage roll. (10 cents each ) We used to buy 3 or 4 because we knew that there would be none left at lunch time . Even today i can still remember the fantastic taste of Perks pies . I was sorry when they went off the market . Wish they would restart the factory as i am sure they will put all other pie makers out of bussiness. Here’s hoping. Todays S/K pies are made out of 1 cow 1 kidney. Regards to all. I have heard so much about these Perks Pies. I would really love to see the packaging of it. Does anyone remember the Natal University’s annual Charity Rag – with the procession of floats? Each year at the time of the Rag they brought out the students’ magazine, Nucleus. When you’re wearing the old school tie. He’s Eton a Perks Pie. To my knowledge Perks Pies no longer exists. What sort of pastry did Perks pie use. Really good. Nothing like today. 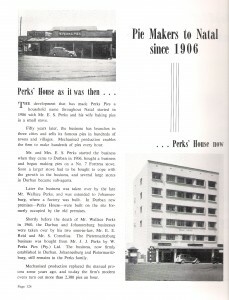 My aunt worked for Perks Pies in Durban. (Quoted from memory – Natal University Rag Nucleus magazine). Sorry about the repetition of the Perks Pie thing above, which was actually part of a Perks advertisement. The Nucleus typically contained jokes which would be considered tame now but which were rather cheeky for the time. Who went into the water up to her knees. It doesn’t rhyme now, but it will when the tide comes in. Just in case some of our readers are a bit younger and cannot connect with the Nucleus, the Nucleus was the name of the RAG magazine. It was was produced by the student RAG committee and had to be ready to be sold on the Friday before Rag ( the float procession) which was always on a Saturday. It sold I think for a Rand which had some value then. Students would gather in groups in their academic gowns at all the main intersections coming into Durban as well as selling in West and Smith Streets going into businesses and offices. I remember 45th Cutting intersection by the Caltex Garage was a popular selling point. The magazine tended to be “clever” and as Mel said “cheeky”. All proceeds of RAG were distributed to charities. Other functions connected with RAG were the choosing of the Miss Freshette from first year students, RAG Queen and Princesses from all the girl students, float building in the evenings culminating on the Friday night before RAG which was quite a ripper with most of Durban’s young people descending on the Varsity grounds. A lot of beer and hard tack was imbibed. The Police used to be called out when things got out of hand. To end off RAG, the highlight was Rag Ball which was an all ticket affair but if you knew someone at Varsity, tickets could be bought through them. Held in the Students Union hall, this was a formal, long dresses , black tie affair, tuxedos were common, with all the Varsity glitterati attending. I seem to temember that Perks in Maritzburg and Durbs were different. The Pmb were in my opinion better and had a lovely flaky crust whilst the Durbs model was short crust. I think that Perks in Pmb opp the post office approximately were linked to a butcher in Mooi river and thats where the neat came from. Would love to get the recipe for the flaky pastry and the steak and kidney insides. Hi. Durban Perks had a lovely short crust pastry. Would love to know more about the pastry. Was it a hot water pastry? Something like pot pies? The filling was nice and peppery. My aunt used to make/bake pies for Durban branch so pastry may have been hand made in those days. I have a hand drawn family tree ( JPEG image) of the Perks/Charles-worth union for anyone interested – please mail me at mwmikep@mweb.co.zs if you would like a copy. If you could further add to what I have it would be greatly appreciated. Hey Nona …. Have you been able to view it on myHeritage ? Alice must’ve have been the surrogate Mom to the younger Charlesworth boys. They all quote her as their next-of-kin. Their parent’s died “youn” (both in their 50’s). Mike has my email address if you want to chat. I have very fond memories of Perks Pies which were sold at our school tuckshop in Houghton, Johannesburg, the late 60’s and possibly early 70’s? Used to pay 10c for a Perk’s Pie back then – except for my favourite which was a curry Perk’s, which for some obscure reason was a cent cheaper at 9c!!! This brings back so many memories. Primary school in Germiston and the later high school there as well, lunch time rush to get my favourite, the beef and onion, or steak and kidney or perhaps the curry pie. Perks pies was loved by everyone from children to our grand parents. And then suddenly they were gone, i have tasted many other pies since then but the name and memories of Perks pies will remain. A bit of youngster compared to the posts here…Arrived in Durban as a young lad of 9 years old…1968.